In the crushing complacency of suburbia, mid-life crises pop in on men’s lives unannounced. For one Long Island podiatrist, it takes an impromptu act of vandalism just to make him aware of his own being. Walking home in the sub-zero wind chill of a Friday night, he stumbles on a bottle of horseradish, twisting his ankle, and in a moment of adrenaline-fuel anger, chucks it over his shoulder . . . and through the window of a popular store selling tween fashions. This one tiny, out-of-character impulse turns his life vivid and terrifying, triggering waves of fear, crooked cops, and suspicions of anti-Semitism, both accurate and paranoid. The story is told by this same podiatrist, an often hysterical, endearingly wide-eyed, and entirely nameless narrator, to what he regards as the perfect audience: a comatose college friend. Yet, our narrator’s most unique quality lies simply in his glowing love for his wife Alyse, the girl of his dreams whom he met in college and still can’t quite believe he married. She is the mother of his two children, Esme and Charlie, who are just starting to come into their own minds and experiencing their first encounters with prejudice. 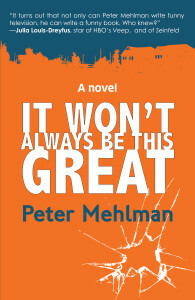 Chock full of heart and humor, It Won’t Always Be This Great, the debut novel of former Seinfeld writer Peter Mehlman, shows how one man’s story is never really his story alone—it’s the story of his family, of his friends, of those he neglected, of those he remembers, of his enemies, and of his hopes, failures, dreams, and realities. And how one man’s moment of rage snowballs into an entirely new life for him and his neighbors.